“Magedi” stained glass lamps workroom is one of the places on the map of right-bank Warsaw where we come across the artistic craft at the top level. This is a place where charming utility objects are created out of the hand-molten glass which is stained with the use of metal oxides. The identification mark of this workroom are the author designs inspired by Art Deco, Bauhaus, Java Style and widely understood Modernism, as well as the replicas of the lamps of artists such as: Tiffany, Behrens or Mackintosh. We will visit the new seat where you can find a gallery room with the exhibition of approx. 150 lamp designs and a workroom. Experienced craftsmen cut glass elements, wrap them in copper foil and join with the use of tin. During the meeting, the participants will see into the stained-glass lamp designing and manufacturing processes, they will also see moulds made of various materials and the drawings which are indispensable to their manufacturing. The owner of the workroom – Edward Magdziarz – has been connected with the Warsaw’s Praga district both in terms of his family and profession. This is where he spent his childhood, took part in constructing crafts pavilions at 18 Targowa Street. We are glad to see that the new seat of the workroom is located in Praga and will become an attractive element of the craft and artistic environment. The search for a new place for Mr Magdziarz’s workroom was supported by the Area Leaders as part of the “Rewitalizacja – nasza wspólna sprawa” [“Revitalisation – our common issue”] project. 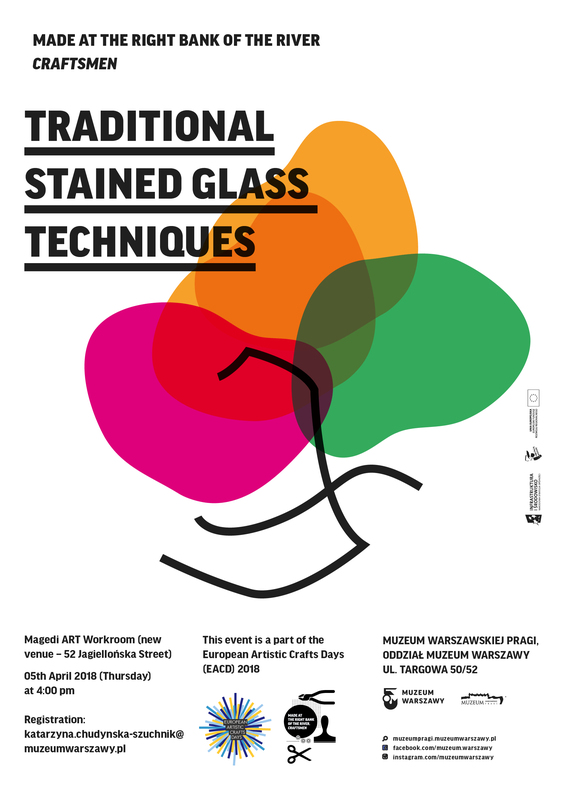 Event is as part of the European Artistic Crafts Days (EACD) 2018.